Also, you can learn from Julia Child (we’ve already discussed in this post on how Joan Rivers can help you become a better writer), and from the movie “Julie/Julia,” starring Meryl Streep and Amy Adams. After blogger Julie Powell sets out to cook a year’s worth of Julia Child recipes and write about it, her idol Julia pans her work. As ghostwriters, we know that the idealized version of the client and the book is not necessarily the one that matters—because it is the client’s book. We can advise, we can cajole and we can subtly add our influence. There may be two clients we’re serving: the Julia in our head and the real flesh-and-blood Julia who critiques and who is human. This doesn’t mean you check your principles, tastes, and ideas at the door. It simply means compromise. Recognize that, as we wrote in an earlier blog post, uncertainty is part of the job (and of life). 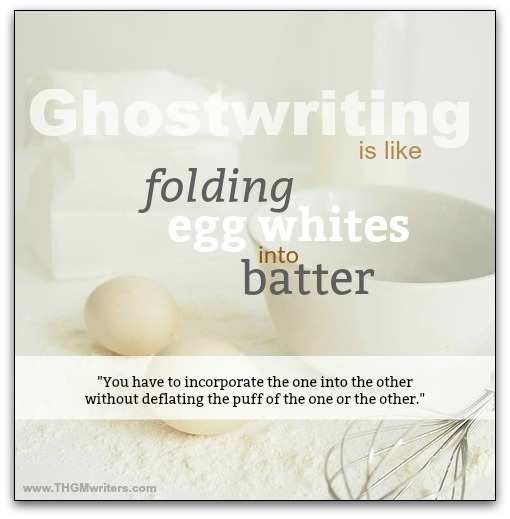 An excellent metaphor for blending the work of writer and ghostwriter!